My favorite kinds of origami are practical models, models which can be used in every day life. 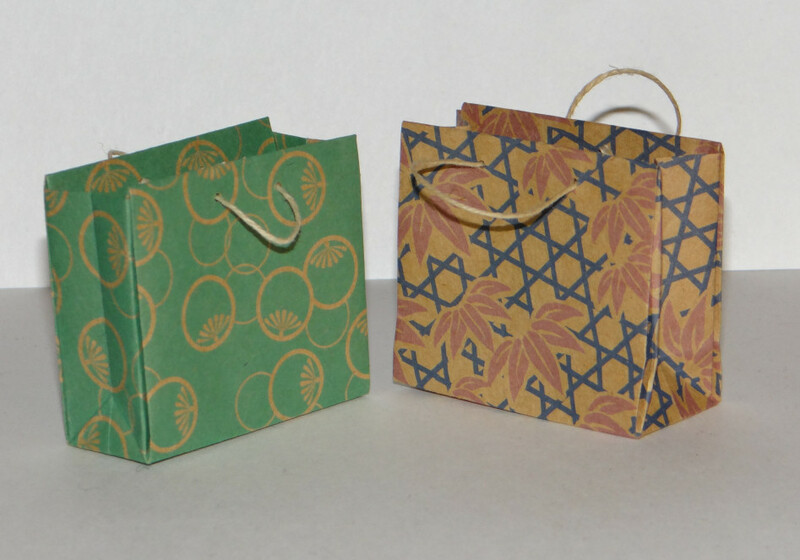 It's the first thing I look for in any origami book, the tatos (flat containers) and boxes. My favorite model is the traditional masu box. So a book full of practical origami projects is very exciting. This book is full of boxes, envelopes, wrappers and little pouches. A lot of them start with a sheet of paper that's in A1 proportions but can be folded using US letter size. Most are based on the more traditional square. The diagrams are very easy to follow, with written instructions to help. Where a fold might be tricky, there is a diagram to show what the model should look like at that point. Getting straight to my favorite projects, there are several tato style flat pouches that can be used to hold seasonings for bento, small gifts or small items like needles or paper clips. The herb pouch, folded out of thin, translucent paper is secure enough to hold seeds. Several of the other pouches would make nice needle packets. I really like the pepper pouch as well. Folded it has a small gap on the top to use as a shaker. Many of the boxes are very easy to fold. My favorite project is the bag. It uses no glue or cutting, except for adding the handle. Using a square of paper, you wind up with a little bag that looks like a shopping bag. It's easy to fold, and a model that I'll be using often. My other favorite is a bento box folded from a single sheet of rectangular paper to make a lidded, biodegradable box. There is a section on how to resize box models to fit different sizes of paper. There are also measurements given where necessary for some boxes. There are card cases, chopstick wrappers, chopstick rests, a picture frame, and lots of great envelopes. There are also a few models that are just for decoration. 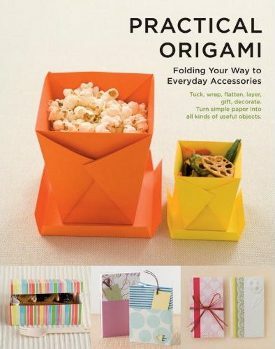 This is the origami book I've always wanted, and one that I'll refer to often. There are a few intermediate projects, but most of the projects are easy enough for an absolute beginner.I think scrapbookers will enjoy the envelopes. The food serving ideas are wonderful for people who entertain. People who bake gifts will enjoy the range of boxes that could be used to give people cookies. It's a great collection of practical projects.